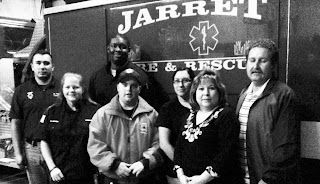 VON ORMY– Jarret Volunteer Fire Department approved the bid of Beauden General Contractor of San Antonio to construct their new fire station in the City of Von Ormy. The bidding was conducted under the guidelines of the US. Department of Agriculture, which is helping finance the project. The station design was modified slightly to bring the cost of the project at $1 million dollars, even though the department was approved for $1.5 million. The station will be located on Quarter Horse Road in Von Ormy Heights. Though slowed due to the holidays, the next major step for the project will be closing on the purchase of three acres of land from the City of Von Ormy, which has already been approved by the City Council. Construction is expected to begin in the Spring of 2013. In other news department members elected new board members for 2013. They are Asst. Chief Marcus Alexander, Captain Rebekah Salinas, Captain Daniel Tamez, Trainee Sammy Hynes, Lieutenant Christopher Zelinsky and community representatives David De Luna and Susan Flores.